I was doing some recreational, light reading on the Jewish Midrash and came across the Jewish take on Aaron. Aaron is a controversial figure for Jewish scholars. Why would God have such a wimpy guy, the one who fell under the pressure of the people to make the golden calf while Moses was on the Mount, to head up the priestly system? They point to the fact that when God called Moses to get the people out of Egypt, Moses argued for about three chapters with God about how he really shouldn’t do it, isn’t there a better way, what will the Israelites say? God picked Aaron to help out. Aaron came. Never said a word. Just did what he was told. Just like he did with the people who wanted the golden calf. Yes, Aaron did his job, but so did Moses and Moses gets more credit than Aaron. Does God like people who argue? Ask Moses. We are a people obsessed with our rights and our freedoms. It seems like every day there is a new “rights” document put out—taxpayer’s rights, student’s rights, women’s rights, hockey fan’s rights, etc. What’s up with all the rights? Trust me, I’m all for my rights, but I also know that my rights get me in trouble, especially in light of my faith. The apostle Paul talks about being a servant of God, or being a slave to God. A slave was someone who was owned by another and who had no rights or freedoms. We don’t like that so much, so we pull out the few verses where Paul seems to say we’re all about our rights—we’re no more servants but sons, we have liberty, etc. 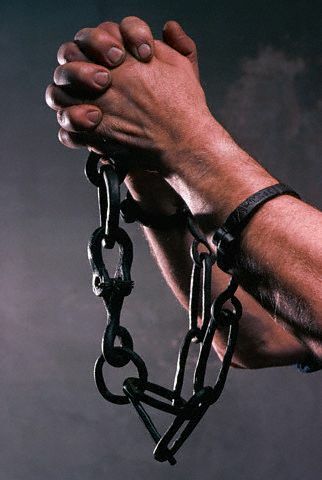 The problem is that Paul says he was God’s slave, Christ came in the form of a servant, Peter, James and John all call themselves slaves of God along with Abraham and Moses. Paul calls other people he knows good servants of God. Paul goes so far as to say he’s a servant to all. How can Paul, at the same time, promote liberty and freedom and then consider himself to have no freedom and be bound to Christ? How can he be a freedom living slave? I’ve never been a big fan of Halloween. I always thought it was kind of dumb. As a kid I always seemed to have a knack for making money and figured if I wanted candy I could go to the store and actually buy some good stuff instead of what old people thought I should be eating. Haunted houses never scared me because being legally blind I could never really see what was supposed to be freaking me out anyway. It all looks dark to me. On top of that, Christians added their own weirdness to it. I had to listen to deals about the occult and all this stuff that really has nothing to do with Halloween. Now that I’m older and much more intelligent, I fear Halloween even less. It’s all just dumb. Here’s a story about a witch who was ordered to reimburse a client after her spell didn’t work. Then there’s this: a physicist has done some study on the plausibility of ghosts, vampires and zombies and concluded that they are all impossible. Instead, I’ll give you something to really be scared about. Kent Hovind’s trial is winding down, jury is to go into deliberations by Thursday. Here are the highlights to this point. Despite a million-dollar business and speaking engagement earnings of nearly $50,000 a year, Pensacola evangelists Kent and Jo Hovind did not count the money as income. Jo Hovind even filed for financial assistance from Baptist Healthcare for her medical bills. Schneider testified that in 2002, the ministry sold more than $1.8 million in Christian merchandise. But Hovind believes he and his employees work for God, are paid by God and, therefore, aren’t subject to taxation. Schneider, who was on the stand for nearly eight hours on Monday, testified that Kent Hovind was confrontational and uncooperative. On Hovind’s radio show aired over the Internet, the evangelist prayed that something would stop the agents’ investigation. “We took it seriously and were aware of our own personal safety,” Schneider said. Schneider also testified that Hovind refused to provide tax information to churches that paid him for speaking. Schneider said the Hovinds wrote checks to their children from their Creation Science Evangelism account. They also withdrew money from that account for cashier’s checks. Sounds like a good Christian man carrying out the work of the Lord, just let him be. Philip Yancey is my favorite Christian author. He repeatedly comes out with thought-provoking books. His writing is easy to read and filled with insight. The Bible Jesus Read is the latest of his books I have read. It’s basically Yancey’s thoughts on the Old Testament. More people should read OT scriptures because they teach us so much about the character of God and human nature. I wouldn’t consider this to be one of his best books. I thought his treatment of Job was good but not as insightful as much of his stuff. He had a bit on Moses being a decrepit old man barely able to breath even though Deuteronomy 34:7 says Moses died in full strength. All that being said, it’s still a good book and I think anyone would gain some inspiration to dust off their OT and get reading. My favorite chapter was on the Psalms. Ever wonder how the psalmists can get away with wishing for people to die? So did Yancey and he has a good answer too. I’m wondering if when God became a human being, He felt claustrophobic all the time. Author jeffPosted on October 30, 2006 Categories Uncategorized1 Comment on Hmmmmm. . . .
Kent Hovind’s tax fraud trial should finally get under way today. It was postponed last week because Hovind’s lawyer was allegedly sick. Hovind allegedly has not been paying taxes. He allegedly says he doesn’t have to because he’s allegedly a Christian and the Bible allegedly tells him not to pay taxes. Allegedly he’s quite wrong on that one.